Following are a newspaper article on the effects of militia bands following union rules to refuse to play alongside other military bands and the resulting General Order. Toronto, May 28.—A drastic order regarding union musicians in military bands will, it is understood, be issued shortly by the minister of militia and will affect both the G.G.F.G. and the 43rd D.C.O.R. bands. It will provide that military bands are not to be unionized; if they are, that they must not accept outside engagements. For many moons there has been discord in Ottawa musical circles over the American Federation of Musicians. At first neither of the two military bands were unionized, but after a long agitation both joined the union. Since then there has been more or less friction and on several occasions trouble has resulted in getting music for the exhibition and other functions owing to the union rules. The matter has again come to a climax through a state of affairs in Toronto in connection with the music for the Toronto exhibition. 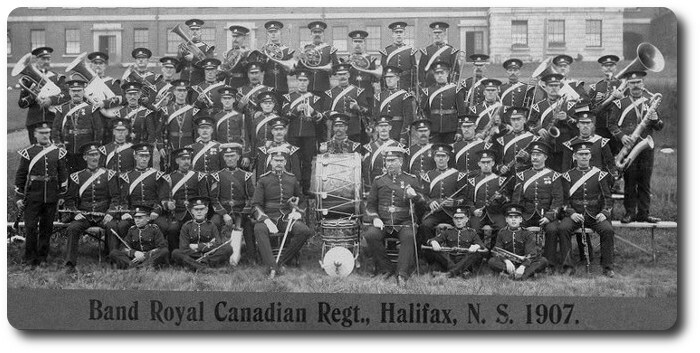 The adjutant general, in an interview with the Evening Citizen, said that it had come to his ears, unofficially, that the Toronto exhibition people had engaged the band of the Royal Canadian Regiment at Halifax to play at the exhibition. Thereupon all the regimental bands of the Toronto militia refuse to play because the band of the permanent force did not belong to the American Federation of musicians. The affair, he said, would certainly be taken up by the minister of militia when it had been reported on officially, as it would be. The idea that one band of his majesty's army refuses to play with another band of the same army because an American union orders it, was certainly something which should be looked into and action taken regarding it. It is understood that as a result the music supplied at the Toronto exhibition will be from the permanent forces at Halifax, Quebec and Kingston. The attention of the Department of Militia and Defence has been called to the fact that in certain instances, military bandsmen have refused to take part in engagements with members of other military bands solely for the reason that they are not members of a recognized union of musicians. While the department does not intend to interfere in any way with the right of militiamen to join Unions, yet as such bandsmen are provided with uniforms, quarters, light and heat, and, in addition, grants of money from public funds are made to military bands, it is not considered in the interests of the discipline of the force that military bandsmen, while in uniform, should be permitted to act in an unmilitary and improper manner. No exception is to be taken on the score of membership or non-membership of military bandsmen in any union or society, and no discrimination shall be made in consequence of such membership or non-membership, provided that such membership or non-membership is not allowed to interfere with the performance of military duties; or to prevent bandsmen, when in the uniform of their corps, taking part in public or private engagements with other members of the militia in uniform, whether they are or are not members of any like union or society. A man who disobeys this regulation is not to be permitted to serve as a bandsman, but must perform his military service in the ranks of his corps. The allowance mentioned in Article 301, Pay and Allowance Regulations, shall not be paid to, or on account of, any band the members of which raise any objection to playing, when in uniform, with non-union members of the corps. Commanding officers will be held responsible that this regulation is read to members of their units before they are detailed as bandsmen. "The Brigade church parade at Montreal furnished an eloquent object lesson on the blissful disregard of the standard cadence by the regimental bands of the Canadian militia. There were no two brass bands of the six on parade that observed the same tempo, and there was almost as much diversity of opinion on the same vital subject among the bugle and fife and drum bands. The whole way to and from the church the greatest difficulty was observed in preserving the intervals between corps. Quick marching regiments would catch up to slower ones in a few minutes, and orders to mark time and to halt were rendered frequently necessary. Standard metronomes should be furnished to all of the regimental bands in the service, and the observance of the regulation tempos and length of space strictly insisted upon. A thorough musical inspection of regimental bands and a regulation of their repertoires of marches would appear to be very much needed. Our bands are given too much to playing florid American and European marches, frequently of very trashy style and generally destructive of steady and comfortable marching." 65th Mount Royal Rifles – 200. 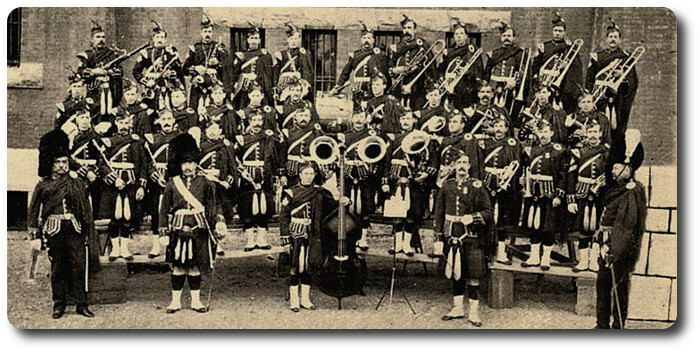 Though the musical public in general are probably unaware of it the question of pitch in Army bands has for long been a vexed one, and the majority of those interested had probably given up all hope of seeing the day when the bands would bring themselves into line with the other musical activities of the country by lowering their pitch. At last something is to be attempted, and all those who know the troubles and disadvantages of the existing situation will hope earnestly that something will also be done. Meantime it is interesting to note that we have learned of this now from Kneller Hall, the famous training school for all British Army bands, but from the "Ceylon Observer" of July 26 which gives a long and interesting account of the whole history of the matter, written by Major W.G. St. Clair. The author has fought long and zealously for this reform, and he, no doubt, penned the last of his sub-titles "The End in Sight," with a thrill of real pleasure. Despite its supreme importance the question of a standard pitch for all music has only comparatively recently been solved. It is pretty clearly established by deduction that pitch in the early days of our music varied not only in different places but with different classes of music. From the fifteenth to the seventeenth centuries the general pitch gradually fell. From the beginning of the eighteenth to the close of the last century it rose steadily. The cause of this rise was the increasing importance of wind instruments. They fix the pitch of orchestral compositions, and the growing demand for louder and more existing effects in music led the manufacturers to build for brilliance. The consequence was that singers were often required to face unnecessary difficulties, and the effect of music in general was falsified to a considerable extent. The importance of the question may be gauged from the instructions issued by the French Government in 1868 to a commission of inquiry: "The constant and increasing elevation of the pitch presents inconveniences by which the musical art, composers, artists, and the musical instrument makers all suffer, and the differences existing between the pitches of different countries, of different musical establishments, and of different manufacturing houses is a source of embarrassment in musical combinations and of differences in commercial relations." The pitch recommended as a standard (A-435.4 vibrations at 59 degrees Fahr.) is the one now adopted by all music-makers with one glaring exception—our British Army Bands. The story of it all, as told by Major St. Clair, is not without its amusing side. It seems that; long ago, Queen's Army Regulations had decreed that the pitch of our Army Bands was to conform to that of the Philharmonic Society of London, which at that time was high. On November 6, 1896, the Society lowered the pitch to the accepted "diapason normale," but unfortunately, though, no doubt quite innocently, they omitted to tell the War Office that they had done so. Since 1896, therefore, the Army bands have been using a higher pitch than the Philharmonic Society in defiance of the regulations. Writing in 1899, Major St. Clair, with a touch of gentle satire, christened the high pitch to which the War Office so fondly clung, the "Kneller Hall Pitch." Two years later, copies of the Major's article found their way to Kneller Hall, the King's Regulations recognized the anomaly of the situation and ordained that "in order to ensure uniformity throughout the Bands of the Service the instruments are to be of the pitch known as the Kneller Hall Pitch." No one would accuse our War Office of a sense of humour, so we must suppose that the authorities thought they were doing well. The turning point came with the appointment of Colonel J.G. Somerville as Commandant of Kneller Hall/ At the annual conference of the British Music Society in 1920, when a whole day's discussion was given to the question of a standard pitch, Colonel Somerville pledged himself to do all in his power to bring the Army bands down from their high pitch, and he is fulfilling his words in many ways. A letter of his to "The Times" attracted the attention of a "very influential person," and "as a direct consequence of this," he says in a recent letter to Major St. Clair, "an item was put into the Military Budget of a first instalment for the conversion of the pitch." There is no doubt, as he says, that this will be "axed" by Treasury, but he gets comfort from the thought that it will continue to be brought forward automatically year by year till actioned. Major St. Clair is not inclined to wait in patience "till the Greek Kalends of normally balanced Budgets and satiated Labour," and has already written to London. The difficulty is, of course, financial. Madame Patti recognized this by giving a cheque for £500 to provide the orchestra at Covent garden with low-pitched instruments, having previously told Sir Michael Costa "that she would neither rehearse nor perform unless the pitch was reduced to that of the Continental operas." The outlay necessary to recondition the Army bands will be much more than that, but it will still be a comparatively small item in the Army Estimates. It is depressing to think that if the change had been made at a proper time the process would have been very much cheaper. Musically speaking, armed forces musicians will be working to beat the band during centennial year. The 790 musicians who make up the 17 navy, army and air force bands have a heavy schedule — already under way — which involves performances from coast to coast in Canada and from Washington, D.C., to Whitehorse, Y.T., in the north. In all they will give more than 750 separate performances during the year. Apart from the more than 400 musical concerts slated for Canadian and American cities, there 151 separate performances of the Canadian Armed Forces Tattoo to be played for in 46 cities and towns across the nation, in which each of the bands will play at least one engagement. At EXPO 67 the bands will provide musical concerts throughout EXPO's six-month run. The Pan-American Games at Winnipeg will feature the music of the RCAF's Training Command Band Winnipeg, during its two-week engagement in July and August. Apart from guard mounting duties in Parliament Hill and musical concerts in other cities, the Canadian Guards ceremonial band will play during 100 guards of honor for heads of state and foreign dignitaries visiting Ottawa this summer. The Tattoo's main musical theme is an original composition by Capt. R.E.J. Milne, director of music for centennial projects, entitled "Marche Vanier." The title was suggested by Mrs. Milne as a tribute to the late Governor General. All royalties from sales of the march music will go from one army to another — the Salvation Army —at Mrs. Vanier's request. The Tattoo has made two bandsmen 100 centennial dollars richer. Petty Officer Ronald McAnaspie of HMCS Stadacona Band and Pte F.T. Bryant of the 1st Battalion, The Black Watch, (Royal Highland Regiment) of Canada, each wrote an original march tune. PO McAnaspie's is entitled "A Century of Progress," and Pte Bryant's, written for the pipes and drums, is called "Maid of the Mist." 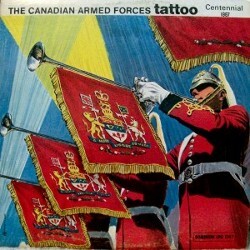 The entire musical score of the Tattoo, played by a selected group of armed forces musicians from each of the 17 bands, has been recorded through RCA Victor. On the Dominion label, the record will be sold at all Tattoo performances throughout the country as well as in retail record shops. The Royal Canadian Navy bands participating in centennial ceremonies are The Stadacona Band from CFB Halifax, The Naden Band from CFB Esquimalt, and The Cornwallis Band from CFB Cornwallis, N.S. Army bands include the Royal Canadian Horse Artillery, Royal Canadian Dragoons, Lord Strathcona's Horse (Royal Canadians), Royal Canadian Artillery, Royal Canadian Engineers, Royal Canadian Corps of Signals, The Canadian Guards, Royal Canadian Regiment, princess Patricia's Canadian Light Infantry, The Royal 22nd Regiment, The Black Watch, (Royal Highland Regiment) of Canada, and the Royal Canadian Ordnance Corps. The Royal Canadian Air Force will be represented by the central Band from CFB Rockcliffe, Ont., and the Training Command Band. Of Conon and Lysander, and some of Meltaidies. But of all the world's brave heroes, there's none that can compare. We throw them from the glacis, about the enemies' ears. And all the gods celestial descending from their spheres Beheld with adoration the British Grenadier. These lyrics are the Royal Military School of Music approved version as provided in "History of the marches in Canada" by Jack Kopstein and Ian Pearson, Highnell printing, 1994.